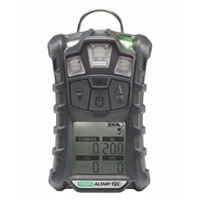 The ALTAIR 4X is an extremely durable Multigas Detector that simultabeously measures up to four gases from a wide range of XCell(R) sensor options including combustable gases, O2, CO, H2S, SO2, and NO2. The ALTAIR 4X Detector surpasses industry standards in several crucial areas. Its four-year sensor life is 60% longer than the industry average, while its 24-hour run time exceedsthe industry average by 71%. This versatile portable detector is a perfect match for industries ranging from fire fighting to welding, and its digital sensor output makes it less likely to suffer from RF interference. The unit features excelusive MotionAlert, which lets others know if the user has become immonile, and InstantAlert, a manual alarm that alerts others of potentially dangerous situtations. This rugged unit is designed to withstand a drop of up to 20' and uses less than half as much calibration gas as the industry average. MSA ALTAIR 4X Multigas Monitor Packaged Assembly with cylinder is designed to detect LEL, oxygen, carbon monoxide, hydrogen sulfide and nitrogen dioxide. Durable Monitor offers 4 yr sensor life which is 60% longer than the industry average and 24 hr run time exceeds the industry average by 71%. It is suitable for confined space, combustible detection, toxic detection and oxygen detection. Monitor has ribbed rubber housing to offer firm grip and high durability. This is the instrument only Altair 5x multigas detector. Look for our other rugged MSA detectors that include SO2 detection, color display and probe. The rugged, multi-featured ALTAIR 5X Multigas Detector boasts several options that provide maximum safety and make it easy to use in even the most demanding situations. It features large buttons for easy use, and its polycarbonate housing protects the detector for drops of up to 10 ft (3 m). The detector also boasts the exclusive MotionAlert, which lets others know if the user has become immobile, and InstantAlert, a manual alarm that alerts others if a dangerous situation has arisen. The large buttons and bright display makes operation possible even when the user is wearing gloves. ALTAIR 5X is capable of measuring up to 6 gases simultaneously and is driven by advanced MSA XCell Sensor Technology. These sensors offer superior response time, stability, accuracy, and reliability together with an extended service life.